The failure of current mechanisms to either predict the collapse of various companies or curb corrupt practises has kept the subject of external reporting to the fore. Is Fair Value Fair? 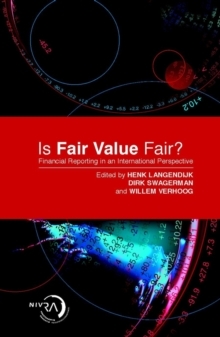 Financial Reporting in an International Perspective contains contributions from many highly--respected individuals involved in external reporting, regulation and standard setting. Their contributions discuss the future of * regulation* application of standards* supervision* auditCurrent trends are discussed, as are ways in which the current regulatory environment could be improved. With the new IFRS regulations coming into force in 2005, financial reporting is set toface radical changes. Is Fair Value Fair? fully prepares readers for these changes and is an invaluable tool for corporate financiers and institutional investors with an interest in the regulatory environment.